Well hello my fellow crafter's and friends, I know it's been a while since my last post (I believe I mentioned there may be a delay through May) as I dealt with some health issues and the death of a very dear friend. But I'm back, and I have a very fun kit to show you from Creative Escape Papercrafting (CEP). 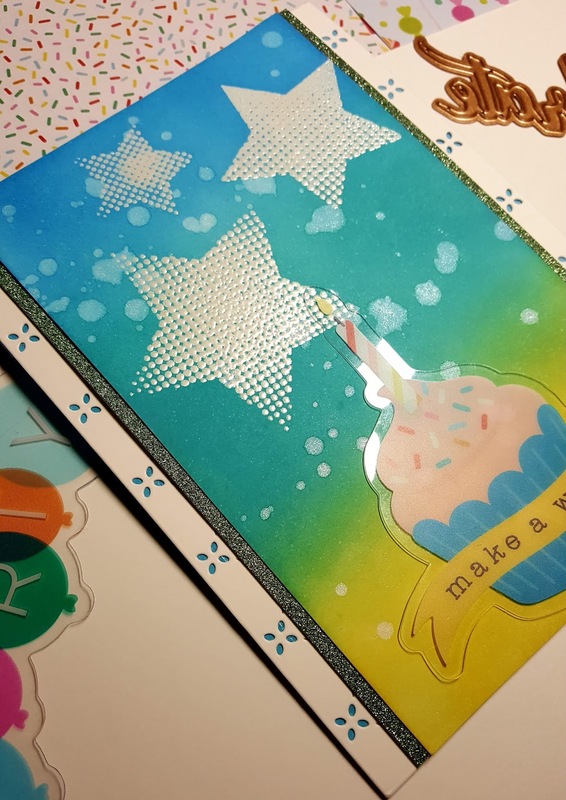 I'm a guest designer and I've made 4 cards so far from the June kit and I'll share how I made each one. My first card (going counter-clockwise from the back right corner) is the Giraffe Shaker card. I used a lot of elements in that card alone. The June kit is built around The Pebbles Happy Hooray Collection. There are 18 sheets of specialty paper, a 40 pack of ephemera, and a 12" x 12" cut-apart sheet that has a nice pattern on the back, so you have options. The other 2 major items are the Altenew Halftone Stars stamp set and a Spellbinders Celebrate word die + balloon die. I'm not going to list all the other pieces in the kit except when I use them on a card. I knew I wanted to do a shaker card as soon as I saw the Heidi Swapp hot pink glitter decorative frame. I decided first on the elements for the outside of the frame, then decided on 2 different specialty papers for inside the shaker and around the frame. 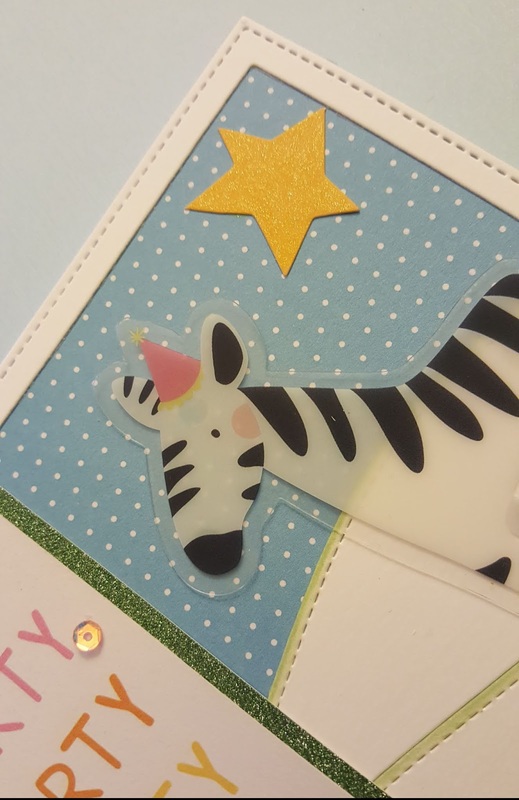 I used the giraffe and star ephemera on the outside, and a piece of rolled up candy ephemera on the inside, which I adhered so it wouldn't shake around with the other elements. I used the Spellbinders die to make the balloon and string, then used a small piece of white/yellow baker's twine from the kit for the bow, which I adhered with a glue dot from my stash. The Spellbinder's "celebrate" was die cut from some green glitter cardstock from the April card kit I had leftover.. That's what's nice about the kits, there are leftovers to use with other projects/cards and keeping the non-perishables like the stamp sets and die cuts are great items to either start a stamp and die collection, or add to your existing ones. I used some of the 3D foam from the kit to adhere the giraffe where it hit the acetate window. To assemble my shaker, I adhered some strips of Thermoweb dimensional foam (from April's kit), but cut them in half down the length of the strip. I then adhered it all around the back side of my frame (I previously glued the clear acetate window in place). I then filled the window with about half of the Studio Katia Crystal Rainbow Fusion Sequins that I received from CEP. They are very bright and almost iridescent! 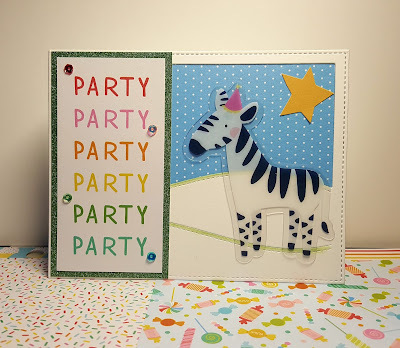 I then carefully placed the rainbow striped specialty paper to the foam adhesive on the back of the frame. I decided to keep the card large so that you could really see the specialty paper on my card base. It is 5.5'' x 5.5''. I cut and scored the yellow cardstock in the kit for my card base, rounded the bottom corners, then adhered a slightly smaller piece of the specialty paper on top, so that the sides would show the pop of yellow that coordinated so nicely with the other elements in the card. Lastly I positioned and adhered the shaker element to my card base. Card #1 complete!! In card #2 I decided to use the Altenew stamp set. I first cut some cardstock that was about 3.5" wide by 5.5" in length. 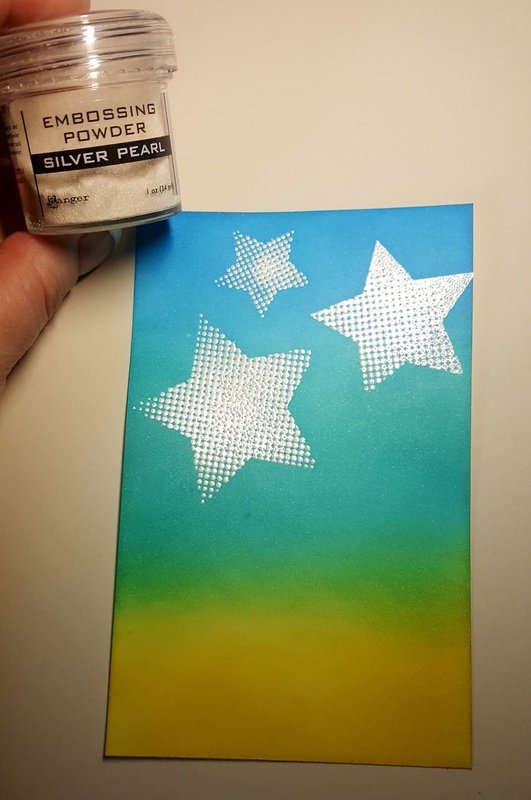 I heat embossed the 3 stars onto the panel using my Ranger's Silver Pearl embossing powder (it leaves a really nice sheen to the stars). I then blended 3 colors of Distress Oxide Inks- Mermaid Lagoon, Peacock Feathers and Fossilized Amber over the star panel. I buffed the stars with a cloth when done to remove any ink remaining on the stars. I then splattered some DIY shimmer to the panel and blotted dry. I picked out an acetate cupcake ephemera to use at the base of my star panel. I used small glue dots from my stash to adhere it so that the adhesive would be nearly invisible. For my card base, I used the blue cardstock in the kit, die cut a piece of white cardstock using Lawn Fawn's Quilted Backdrop that I bought from CEP and adhered it to the blue base. Next I cut strips of the green glitter cardstock (from April's kit) and positioned them so that the reveal was about 1/8th" on both sides from my colored panel. Last I adhered my colored star panel to the prepared base. Card #2 done! Card #3 features a large central oval ephemera sentiment image that I applied some Salty Ocean Distress Oxide ink along the edge to coordinate with the main specialty paper in the background. That paper was the 12" x 12" Pebbles Happy Hooray cut-apart sheet, which I chose to use the backside of, and take advantage of the "YAY" sentiment strip along the bottom edge. I also applied the same Distress Oxide ink to the other 3 edges to make the card more cohesive. 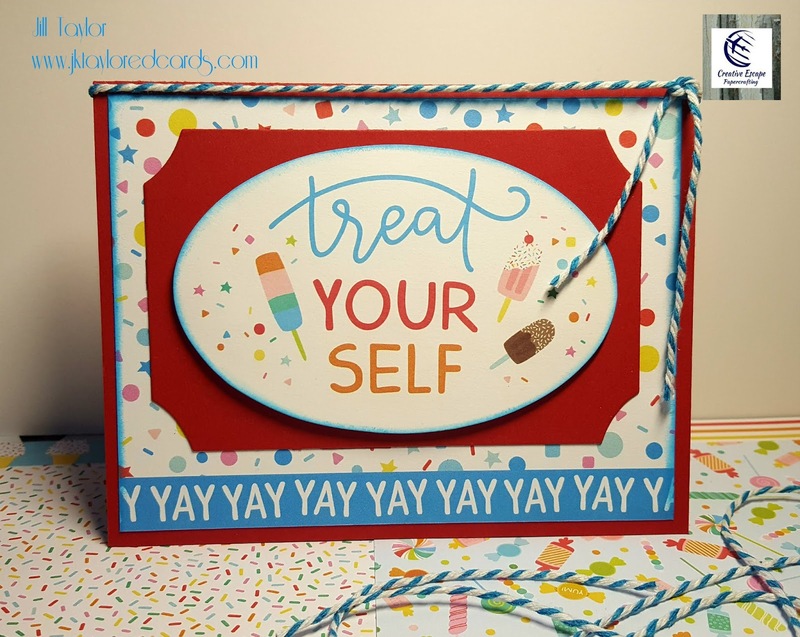 I chose red to be my accent color and used it for my card base, as well as the Sizzix Ticket die that was placed between the ephemera piece and the specialty paper. The red paper came with the kit. I adhered all layers (popping up the ephemera piece) with the included 3D foam pieces in the kit. To finish off my card, I used the blue and white cord included in the kit by tying it around the top of the folded cardbase and tying it off on the right side. That'll do it for card #3!! 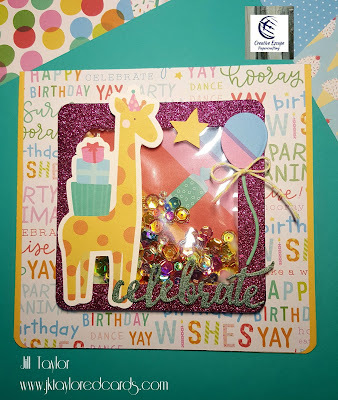 Card #4 uses all kit supplies except for the die cut background hills and frame. That is a Lawn Fawn product called Stitched Hillside Backdrop: Landscape (as it comes in Portrait as well) that I purchased from the store (though I believe they sell the Portrait version). I inked the edges of the 2 hills with Bundled Sage Distress Oxide ink as I felt that coloring the entire hill would look too obtrusive. I decided on the blue and white polka dot specialty paper for the sky. I glued that to the back of my die cut frame/hills, and while it dried I picked through the ephemera to decide what would go on next. First I found the "PARTY" rectangular piece printed in rainbow colors. It was just a tiny bit short, so I decided to frame it, again with the green glitter cardstock from April's kit (I love that stuff!). I adhered the two pieces together, then found several animal pieces in the ephemera. I picked out the Zebra. 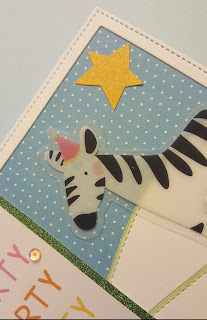 I adhered both elements, using my small glue dots on the Zebra that you can barely see. I also added a star that I found in the ephemera pack. I adhered all of this to my white standard A2 card base. Looking at the card, I decided it needed a little bling! So I pulled out 4 sequins (red, orange, yellow-green, and green) from the Studio Katia pack I received and applied them following the color of the words "PARTY." Now I thought I was done. However, as I was writing this blog and looking at my cards, I realized I had to do one more thing to this card. The flat yellow star was screaming for some of my Wink of Stella! So I grabbed not the clear one I usually use, but the yellow one. I wanted the star to be a bit more vibrant. So now my friends, card #4 is done!! I hope you enjoyed my examples. 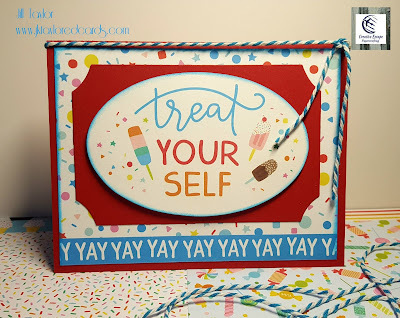 This kit is a lot of fun, especially for kids celebrations. Although the Altenew stamp set makes it very versatile. My goal for the next few cards are making some a bit more for adults. So stay tuned and see how I do! 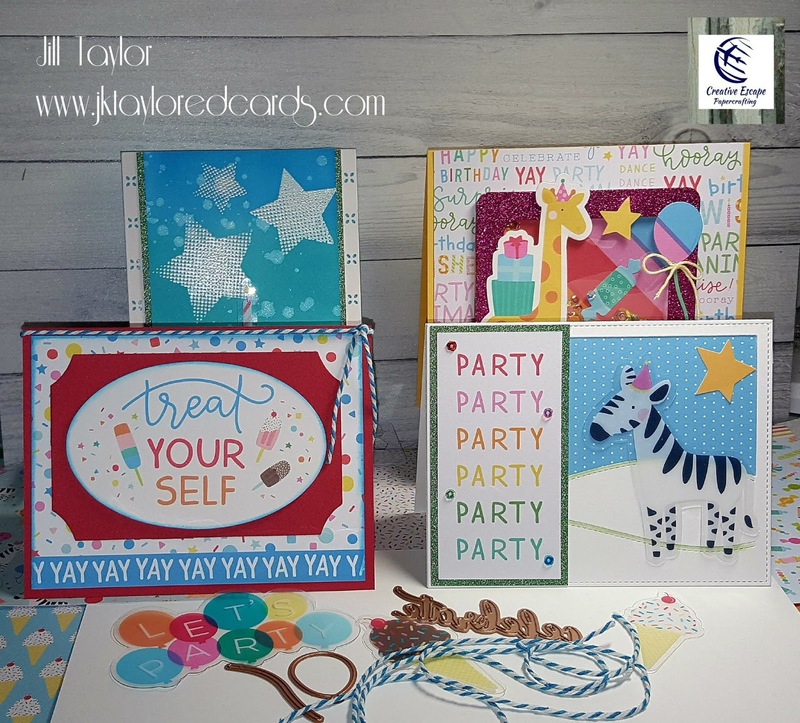 Don't forget to visit me on Instagram, as they have my largest selection of card creations. I am jktaylor911. Please visit the store, there are so many new items to see and a newly redesigned online store at https://creativeescapepapercrafting.com. Also visit their Facebook page to see what all the talented designers are creating as well as new happenings with CEP. For your convenience, I've linked everything to the store and social media.